Back in 1951 there was a lot more room on the National Mall in Washington D. C. There was much more room for a flying saucer to land. 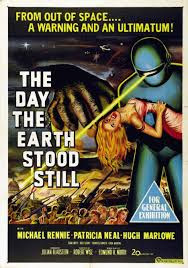 We learned this while watching the classic science fiction film, The Day the Earth Stood Still during our stay in D.C. Directed by Robert Wise (Sound of Music, The Haunting), the film tells the story of an alien that come to bring peace to earth - or else. It made the National Registry of Films and led to memorizing he words "Klaatu barada nikto" being an essential to the life of a nerd. For such a small area (less than 100 square miles), the District of Columbia has been the setting of many films, more than we can mention here. Many have, not surprisingly, been about politics, particularly the Presidency. In Ivan REitman's 1993 comedy Dave, Kevin Kline plays both the President and a man who must double for the President. In a more cynical comedy, 1997's Wag the Dog, the President fakes a war to help with troubles in the polls. And in 1964's even more cynical, Dr. Strangelove or How I Learned to Stop Worrying and Love the Bomb, nuclear war comes about in Stanley Kubrick's classic comedy. Clint Eastwood has made a couple of Presidential action films set in the Capital, 1997's Absolute Power about corruption in the highest places and 1993's In the Line of Fire about a good man in the Secret Service protecting the President. 2013 was a bad year for the White House, being attacked both in White House Down and Olympus Has Fallen (neither of which proved to be too happy of a thing for film goers either). A better fictional film about the Presidency in peril is 1964's Seven Days in May and better still is the true-ish story told about Washington Post reporters investigating a President, All the President's Men. Of course, not all Washington political films are about the President. 1950s Born Yesterday is about a corrupt man content to buy congressman, which earned Judy Holliday an Oscar in her role as the crook's mistress. 2007's chilling true story about a mole in the FBI is set in D.C. but not in the White House. And the delightful 1943 comedy, The More the Merrier is about much more lowly government workers and the housing shortage in D.C. during World War II. The Exorcist is much more about clergy than politicians (and locations of the horror classic's filming are a part of many Georgetown tours). But my favorite Washington D. C. film is probably the Frank Capra classic Mr. Smith Goes to Washington starring Jimmy Stewart and Jean Arthur. Hard to watch this heart-warmer without thinking that those Founding Fathers were really on to something. The film we watched in a theater wasn't set or filmed in America, let alone in the District. Sing Street is set in Ireland in the 1980's and tells the story of many a young man who started a band to get the attention of a girl. We saw this film at the Landmark E Street Theater in Washington on the same evening there was a D.C. type event going on -- a special screening of The Abolitionists, a film about human trafficking. We talked to some folks putting on the event who hoped to put the focus on the very real contemporary tragedy of children trapped in slavery. 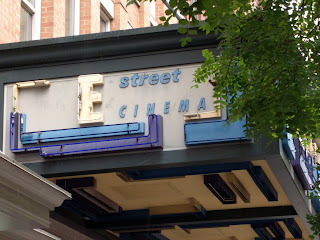 Word was Orrin Hatch was going to attend the screening, but we were not able to see him. (I believe Hatch has been one of Utah's senators since the state entered the Union.) I do hope the film is successful in bringing attention to this important issue.